Financial literacy is a missing component in our school systems. As a result, Americans have not prepared for basic expenses. The widespread lack of a financial education is concerning. According to Forbes, 33% of American adults have nothing saved for retirement and 44% of Americans don’t have enough cash to cover a $400 emergency. That’s one medical bill away from a financial headache. Although, it’s avoidable stress with a little planning. The financial choices you make today will compound. But many of us don’t know where to begin. Whether you’re nearing retirement age or starting out in the working world, it’s important to learn how to manage your finances. Financial literacy can provide you with the building blocks to a sustainable future. The financial literacy guide below can help put you on the path to financial freedom. 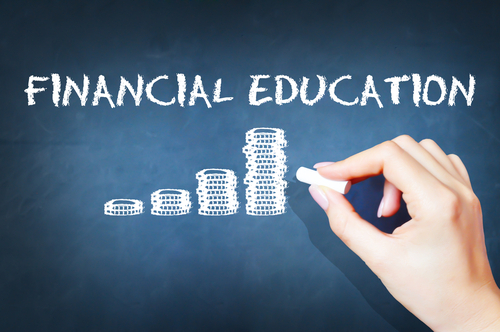 Financial Literacy Definition: Having obtained the knowledge and skills to make informed financial decisions. Many people avoid talking about money. It’s taboo… but this mindset hurts your financial health. So the first step to becoming financially literate is understanding money. Contrary to popular belief, money isn’t evil. Money is a measure of value. So if you add more value at work, you can justify higher pay. This mindset can help you focus on adding value, not just clocking in and out at work. Some of the wealthiest people in America have added the most value to others. Jeff Bezos, Bill Gates and other ultra-wealthy people have improved the lives of millions of Americans. You can build a financial fortress if you learn how to provide value to other people. That’s a core concept to gaining financial literacy. You need to understand how money and our economy works. Money ebbs and flows. But it gravitates to where it’s treated best. Learning how to manage money is vital with any good financial education. Personal finances have a huge impact on your future. The five factors below have helped many people reach – and surpass – the millionaire’s club. Looking at a bank account statement isn’t the highlight of most peoples’ month. Although, it’s important to see where your money is coming in and going out. This insight will help you know where you can cut back. Companies love recurring charges since many customers forget to cancel them. Checking your statements can uncover old recurring payments and also double charges. You can correct the double charges by calling your credit card company. Learning about your expenses and how to budget is vital to improving your finances. Taking a little time each month to plan has a huge impact on your financial health. Albert Einstein is noted for saying that compound interest is the eighth wonder of the world. He who understands it, earns it … he who doesn’t … pays it. Interest is a powerful concept and when you take on debt, you end up spending more. So it’s usually best to avoid borrowing money. Once you’ve paid off your debt, you can stash more cash. Although, this seems to be a foreign concept to many people. Americans in all income brackets find ways to spend everything they earn. They have the opportunity to save, but they don’t plan for the future. To put things in perspective, the personal savings rate in China is 25%. But in the U.S., the personal savings rate is only 6%. That’s a huge gap, and it shows that most Americans can get by on spending less. You have to learn how to save money to build sustainable wealth. Many people ask… what is the most important thing to do when planning for retirement? Two good answers are to make more money and improve investment returns. But the most vital factor is… improve your savings rate. You’ll be better prepared for retirement if you save a larger percentage of your income. Stuffing your savings under a mattress is a misguided action. That money loses spending power due to inflation. A better plan is to make your savings work for you. To earn a little interest, you can put your money to work in a bank. To generate more income, you can invest in bonds, real estate and stocks. One of our favorite ways to invest for income is through dividend stocks. Building a portfolio of dividend-paying stocks can produce a steady stream of cash. To learn more about investing, you can access our free Wealthy Retiremente-letter by Clicking Here. Our Chief Income Strategist Marc Lichtenfeld researches thousands of stocks, and in this e-letter, he gives away some of his top financial research for free. There’s a big difference between tax avoidance and tax evasion. Tax evasion is illegal. It’s not paying taxes you owe. On the other hand, tax avoidance is a way to legally lower your taxes. No one should pay Uncle Sam more than they are legally required to pay. One of the most popular ways to lower taxes is by contributing to IRAs and 401(k)s. Most people should take advantage of these great retirement planning accounts. Although, the tax system is complex, so it’s good to consult a tax professional. Learning the five factors above are vital for financial literacy. At any stage in your life, you can take steps to reaching financial freedom. You work hard for your paycheck… so don’t you want to make your money work for you? Financial planning can help you achieve a steady stream of passive income. That’s one key to reaching a wealthy retirement. Compounding is a powerful passive tool that helps investors grow their wealth over time. Time is of the essence when it comes to wealth building. Whatever you are able to set aside, the time to invest it is now.